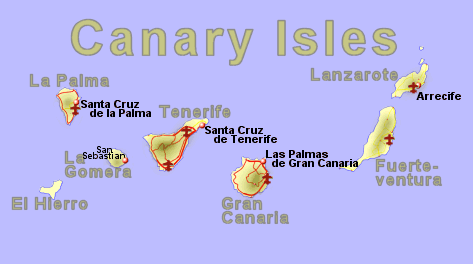 The canary Islands are a group of seven volcanic islands, appriximately 100 to 500 km off the coast of north west Africa, roughly on the same latitude as the border between Morocco and the Sahara Occidental. Although they are all of volcanic origin and relativley close to each other, they are surprisingly different character and appearance. The largest of the seven inhabited Canary Islands, offers a wide range of scenery and attractions with most of the original development being in the north. In this part of the island, there is a higher rainfall resulting in some picturesque green scenery. On the north east coast is Santa Cruz de Tenrife, the capital of the island and on the north west coast is the resort of Puerto de la Cruz, with the Tenerife North Airport roughly halfway between the two. The southern part of the island has a drier landscape with some of the coastline having been developed for tourism. In the centre of the island is Spains highest mountain, Mount Teide, rising to 3718m or 12200 feet, which domates many of the views from the coast. The mountain has a cable car taking visitors to within walking distance of the peak. This will have snow on it during the winter but can be picturesque with wild flowers during spring. Do you want More Information on Tenerife? We have self catering holiday rentals in Tenerife in or near the following towns. The island of Gran Canaria is effectively cone shaped with a volcano (Pico de las Nieves) rising to nearly 2000m in the centre. Below this peak are tranquil valleys and then a coatline that can be rugged or beautiful sandy beaches. Las Palmas, the capital of Gran Canaria, is situated on the North East tip of the island and is a resort in it's own right with a large sandy beach, almost within the city. The main beach resorts however are on the south coast and at Maspalomas, there is a large area of golden sand dunes giving the impression of a mini sahara. We have self catering holiday rentals in Gran Canaria in or near the following towns. Lanzarote is the closest of the Canaries to Africa and differs from some by not having a high volcanic peak but does show the signs of extensive past volcanic activity - over 300 volcanoes infact. One tourist attraction is the Montañas del Fuego, or Mountains of Fire, now part of the Timanfaya National Park. In certain locations, guide may push a small branch into a crack in the ground to show that it will quickly catch fire from the heat below. Part of this volcanic area has been declared a Biosphere Reserve by UNESCO. The main beach resorts ar on the south of the island. We have self catering holiday rentals in Lanzarote in or near the following towns. Fuerteventura is place for beach lovers with large areas of golden sandy beaches, some of which are popular with wind surfers. We have self catering holiday rentals in Fuerteventura in or near the following towns. La Palma (not to be confused with Las Palmas, the capital city of Gran Canaria) is the most North Westerly of the canary islands is relatively lush and green resulting in some good walking country. In the north of the island is the Caldera de Taburiente National Park, one the worlds largest sunken volcanic craters with sides that drop 2000m to the fertile area below. We have self catering holiday rentals in La Palma in or near the following towns.